Grey days are a great excuse to make stuff, particularly if you have kids around the place (I don’t have that as an excuse but I don’t care). Tealight holders are a great way to add a little light to your garden, though more in a ‘pretty ambience for BBQs’ than ‘spot a weed at 50 paces’ kind of way (they also make good alternative bridesmaid bouquets if you’re having a dusk wedding and have adult bridesmaids). However, they can be pricey in the shops. 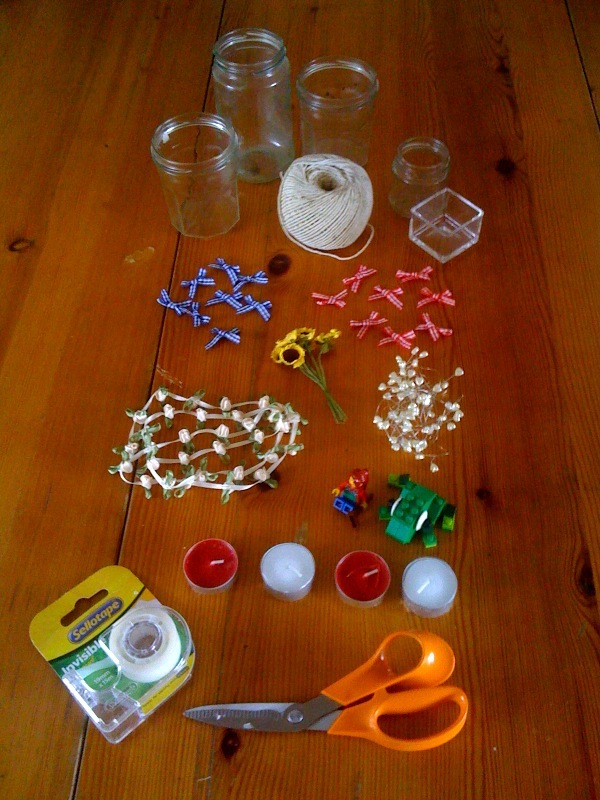 With a little creativity, random junk you may otherwise throw away and a few inexpensive bits of decorative stuff from the shops, you can make your own tealight holders for a fraction of the usual cost. 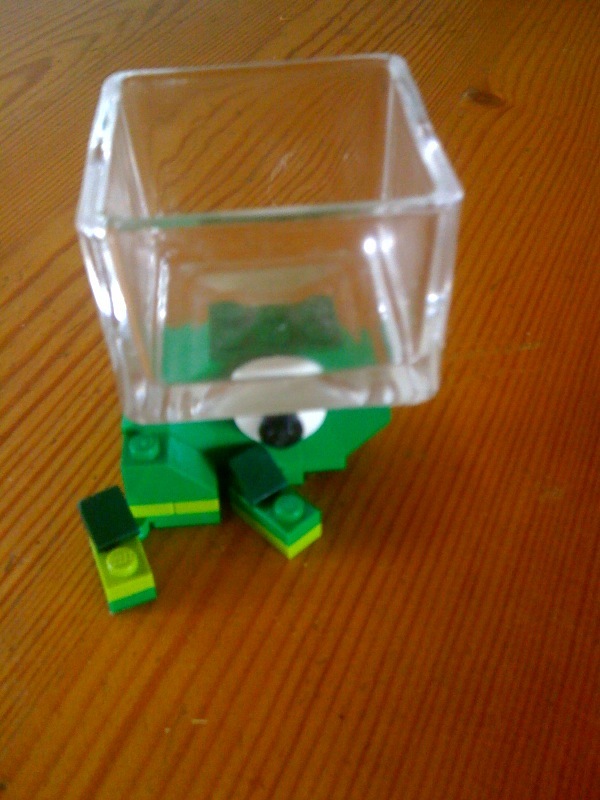 The above tealight holder was made from a left-over candle holder (the kind with the wax poured directly into them – I just soaked it in boiling water until the remaining wax fell out), a Lego frog (currently £1 from Lego shops, bought yesterday though I couldn’t find them on the website, possibly because it’s an initiative to raise money for an autistic children charity and the money goes directly to them rather than Lego) and glue. 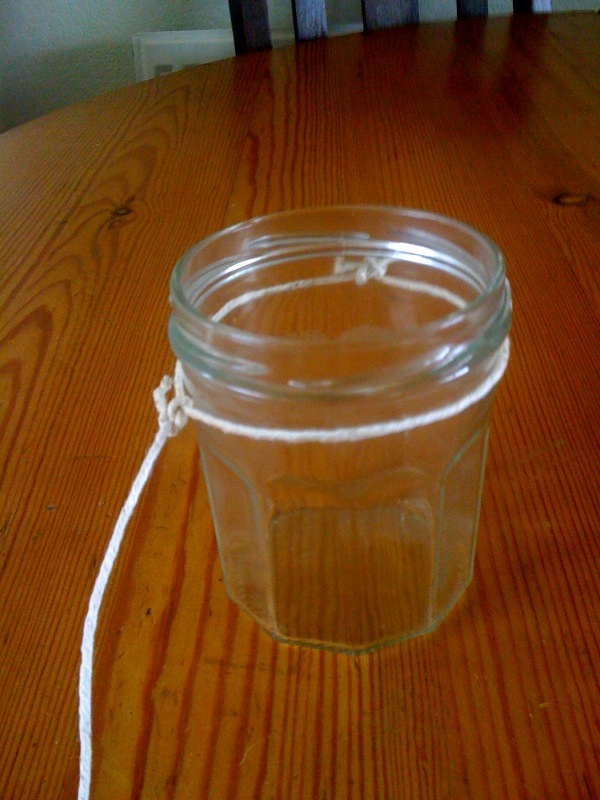 This ridiculously simple guide to making your own tealight holders (sorry if it’s so simple as to be patronising!) 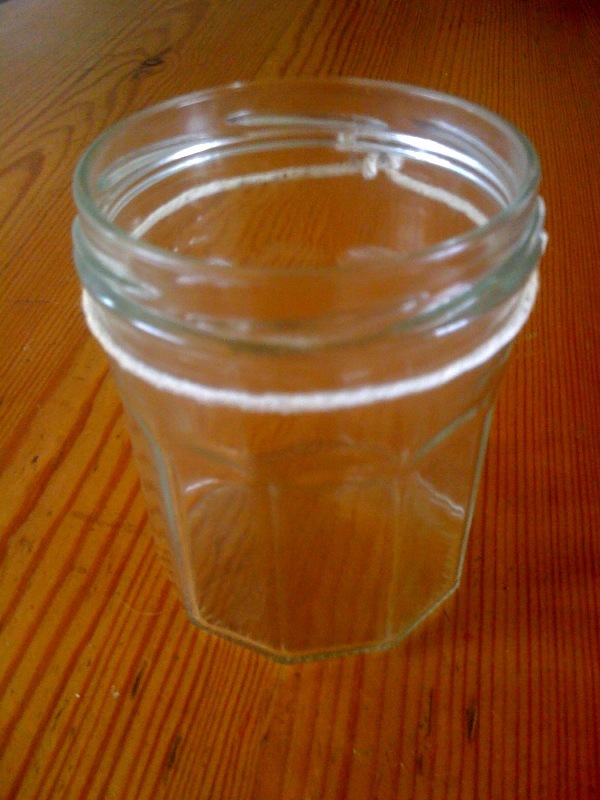 will help you fill your garden with twinkling tealights. You will need jam jars (I put mine through the dishwasher so the labels fall off, though if you have a posh dishwasher and are worried about it clogging, soak the labels off in a washing-up bowl instead, then use the water for the garden), string, ribbon or wire, decorative things of your choice, glue (and tape to hold things in place if you want to test out ideas first), scissors and tealights. 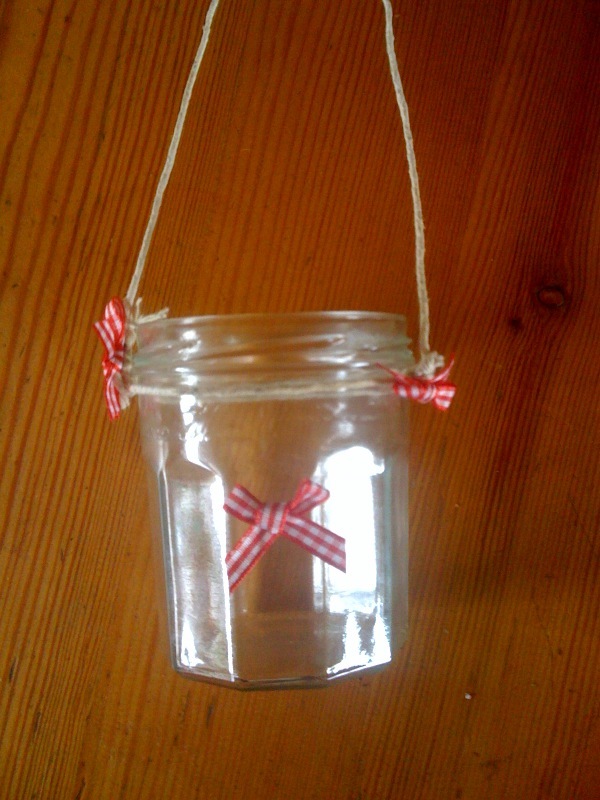 Tie one piece of string or ribbon around the top of the jam jar, making sure that it’s nice and tight. 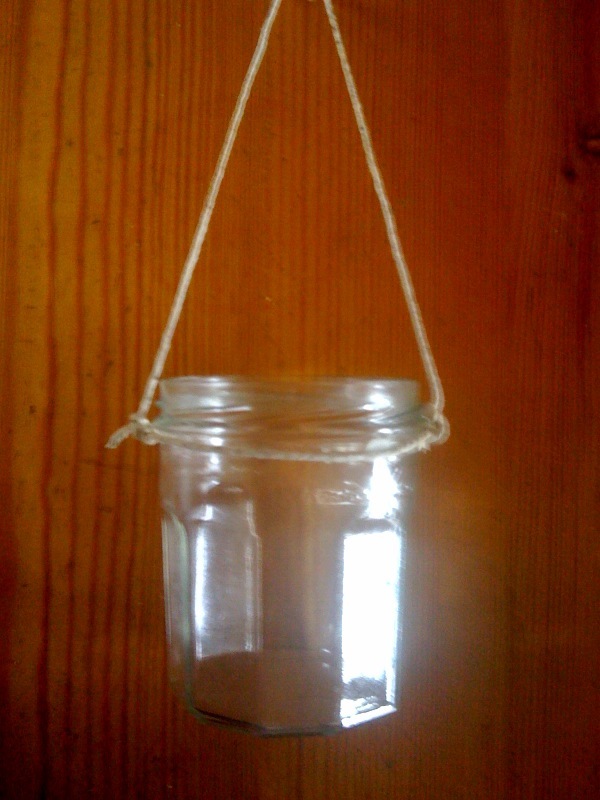 Wetting the string /ribbon first will help, as it’ll dry nice and tightly around the top of the jam jar. 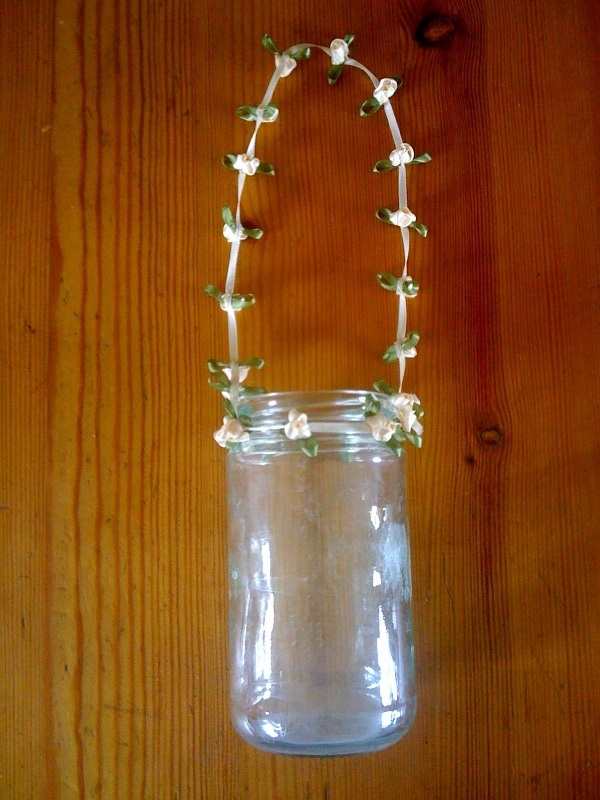 If using wire, twist the ends together instead. Cut a second piece of string or ribbon to form your tealight hanger – make it a little longer than you want it to eventually be to allow for knotting. Tie the second piece of string/ribbon around the first piece, knotting well. Tie the other end of the string opposite the first one, again knotting firmly. Voila – one tealight holder. You may choose to leave it like this if you’re just after something functional that’ll stop tealights getting blown out. However, you can opt for prettifying it. 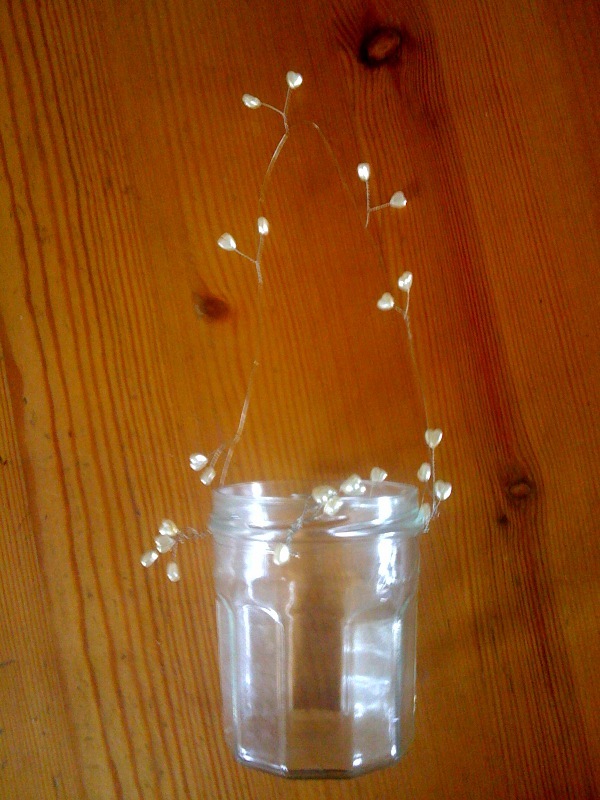 Or you can use decorative wire, for a tealight holder that will be more than happy to live outside.